If you work at a company with multiple locations, you understand that there’s a local aspect to company culture. Showing candidates what it’s like to work for your company means representing each location authentically and uniquely. That’s why Eventbrite has taken a “local” approach to Employer Branding. In their latest careers site upgrade, Eventbrite has created landing pages for each of their main locations, featuring real employee and office photos with localized content. 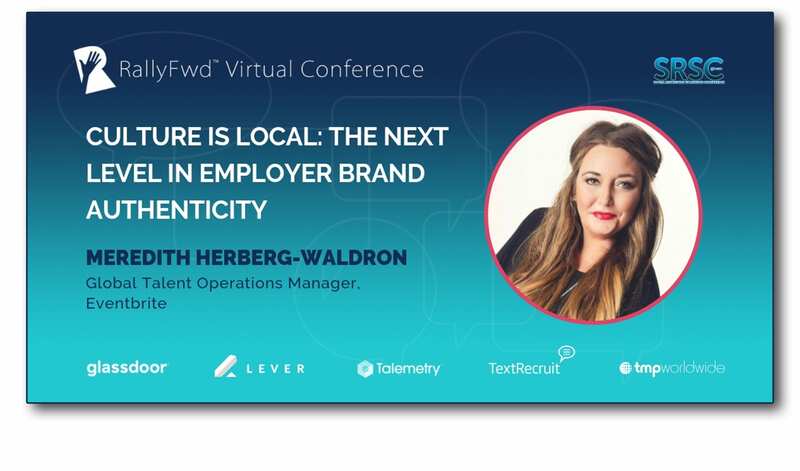 In this RallyFwd session, Meredith Herberg-Waldron, Global Talent Operations Manager at Eventbrite, will present how localizing careers site content has improved the Candidate Experience by giving candidates an accurate depiction of their future day to day. She’ll also share how Eventbrite plans to use the localized data to drive their Recruitment Marketing and Employer Branding efforts for each location. Plus, learn how Meredith galvanized Eventbrite’s offices to help create their local pages, and how you can apply this approach if you have two offices or 200. Meredith Herberg-Waldron is a Nashville music industry vet who made the leap to tech four years ago to join Eventbrite. Originally part of the customer experience team, she quickly fell in love with Talent Acquisition and made the move to Recruiting in 2015. Meredith cut her teeth in operations as a Recruiting Coordinator, and within two years has built a global talent operations team of five spanning three countries. As a self-proclaimed data nerd, Meredith marries metrics, marketing and delightful candidate experiences to help Eventbrite attract, hire and retain top talent for all of their locations globally. When not traveling between offices championing Eventbrite’s award-winning company culture, you can find her spending time with friends, margarita in hand, enthusiastically cheering on the Red Sox and Packers (often also with a margarita in hand), and spending time with her part-dog-part-dingo pup, Tessie Fenway. Glassdoor, Lever, Talemetry, TextRecruit and TMP Worldwide are a sponsors of Rally. Their sponsorship helps us to create educational content and events on Recruitment Marketing.